Player/coach to wear #48 in the most seasons: Mike Torrez, Jose DeLeon and Brad Thompson (5). Cruz joins that club this year. I don’t think we can say that the number 48 has an illustrious history in the annals of the Cardinals. Granted, I say that as a proponent of a number (70) that’s had all of two players put it on their back in the entire 100+ years of St. Louis baseball, but still. Maybe Torrez strikes a cord for those that go back that far, but he really made his name elsewhere after starting his career with the birds on the bat. After that, it’s relievers and utility players. The closest thing to a Hall of Famer is Rich Batchelor (1993), who came over from the Yankees for a Hall-of-Fame candidate (Lee Smith). We see it today with Tony Cruz, a man that stays on the bench much more than he gets into the game and a player that, when the team was faced with him being a starter for an extended period of time, went and got not one but two different catchers to take that load off his shoulders. That’s not a number that is going to get a lot of exposure and a lot of folks wanting to put it on their back. Not to say that there haven’t been some low-level fan favorites. Everyone remembers Super Joe from 1998 and Babyface Brad from his years in the Cardinal bullpen and occasionally rotation. (Granted, some of us also remember Thompson by his Internet nickname “Puppy Kicker“, but that’s really incidental to his work on the diamond.) On the whole, there’s no much here. Which makes DeLeon the perfect selection. 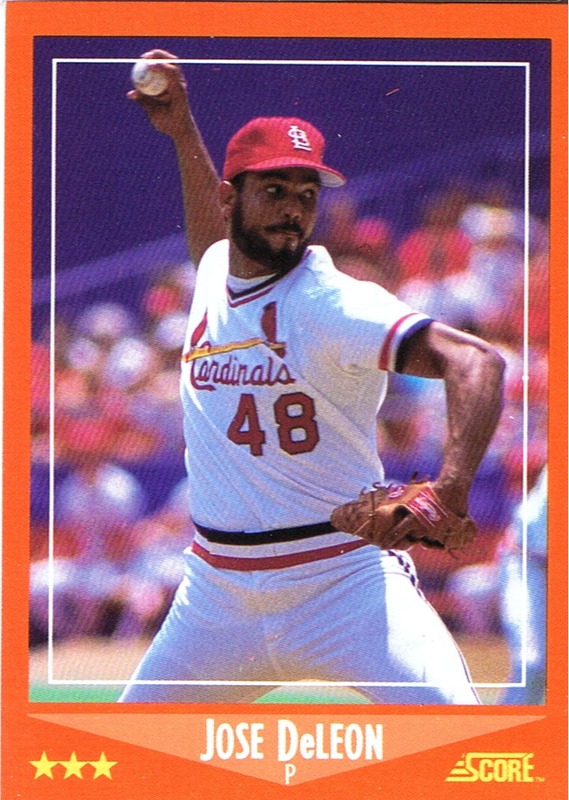 DeLeon was the diamond in the rough on some of his teams in St. Louis, as he came as the 1980s powerhouse was making way for the early-90’s debacle. He had 16 wins for the 1989 team that faltered down the stretch before leading the league in losses in 1990 for that last-place Cards squad. The next year, he was well under .500 in decisions even though he had a nice 2.71 ERA. The first two years of his time in St. Louis were good, the last three were much weaker. All in all, DeLeon fits this middling number pretty well.